Shavuot 25a ~ How Long Can You Go Without Sleep? How long can you go without sleep? If you are like me, staying awake for just one night can be very challenging. I worked my share of night shifts in the emergency department for over fifteen years (amounting to hundreds of overnight shifts) but it never got any easier with time. We all push ourselves when we need to, but is there a physiological limit to the amount of time that you can stay awake? Rabbi Yochanan ruled that it was impossible to remain awake for more that three days. What does science have to say? A 1970 study of four volunteers who stayed awake for 205 hours (that’s eight and a half days!) noted some differences in how the subjects slept once they were allowed to do so, but follow-up testing of the group conducted 6-9 months after the sleep deprivation showed that their sleep patterns were similar to the pre-deprivation recordings. One possible explanation was suggested in a 2013 by a group from the University of Rochester Medical Center. 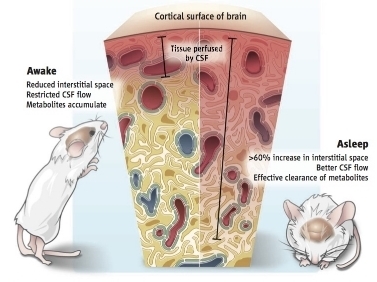 They demonstrated that during sleep, the space between the cells of the brain (the interstitial space) increased by up to 60%, allowing toxic metabolites to be cleared. This raises the question of whether the brain sleeps in order to expel these toxic chemicals, or rather it is the chemicals themselves that drive the brain to switch into a sleep state. Not having any sleep is bad for your health - but so too is going without enough sleep. Chronic restriction of sleep to six hours or less per night can produce cognitive performance deficits equivalent to up to two nights of total sleep deprivation. So be sure to get a full night's rest. How long did the Vilna Gaon stay awake? In his recent book on the Vilna Gaon, Eli Stern reviewed an episode in which the Gaon (d. 1797) was jailed on charges of kidnapping. (It’s a long story, but the Vilna Gaon was involved in the kidnapping of a young Jewish man who had converted to Christianity.) This episode occurred in January 1788, after which the Gaon was arrested and held for over a month. The case was later tried, and on September 15, 1789 (sic) the Gaon of Vilna (together with others involved in the kidnapping) was sentenced to twelve weeks in jail. Although it is unclear how long he was imprisoned, he was there over Sukkot, and the Lithuanian authorities were hardly in the practice of providing imprisoned Jews with a sukkah. But since one is not permitted to sleep outside of the sukkah, what was the Gaon to do? Simple. He’d stay awake, and by doing so he would not transgress the prohibition of sleeping outside the sukkah. Here’s how the episode is described in the work Tosefet Ma’aseh Rav published in 1892. Our Leader, teacher and Rabbi may he rest in peace, when he was imprisoned on Sukkot, tried with all his strength, and walked from one place to another, and held his eyelids open, and made an extraordinary effort not to sleep outside the sukkah – not even a brief nap – until the authorities released him to a sukkah. We don’t know for how long the sixty-nine year-old Elijah stayed awake, but any suggestion that he was awake for the entire holiday of Sukkot seems to be far fetched (though as we have seen, not entirely impossible). In tomorrow's daf, Rabbi Yochanan ruled that since it impossible to stay awake for more than three days, any vow to do so is considered to have been a vow made in vain – and punishment follows swiftly. Here is how the ArtScroll Talmud explains this ruling, (based on the explanation of the Ran). Since it is impossible for a person to go without sleep for three days, the man has uttered a vain oath. Hence, he receives lashes for violating the prohibition (Exodus 20:7): לא תשא את שם ה׳ אלוקיך לשוה, You shall not take the Name of Hashem, your God, in vain. And since the oath -being impossible to fulfill -has no validity, he is not bound by it at all and may sleep immediately. We have seen however, that while it’s not a good idea to do so on any kind of regular basis, it is certainly possible to stay up for longer than three days. (Back in the 1970s, some volunteers would even do so for as little as $100). Maimonides codified this law and also assume that it is impossible to stay awake for three consecutive days. Based on what we've reviewed, Rabbi Yochanan was incorrect when he stated that it was impossible to stay awake for three days. It's certainly not impossible, but that hardly means it's a good idea to try. This may explain the teaching of Rabbi Chaninah ben Chachina'i in Masechet Avot (3:4) who taught that one who stays awake at night "will forfeit with his life." Now that's a warning to heed.